Please send me your intentions for our Annunciation Octave of Masses and request Votive Lights to burn at our Lady’s Shrine. 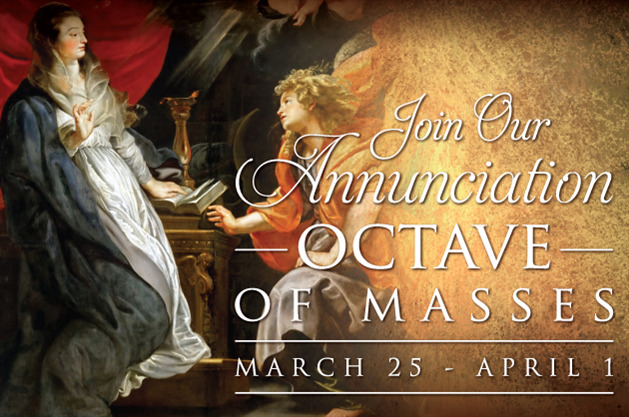 The octave begins Monday, March 25, and we want to remember you and your prayer requests throughout the eight days. On the feast of the Annunciation, March 25, the Church celebrates Mary’s “yes” to God to become the Mother of our Lord, Jesus Christ. We hope you will come, in person or in spirit, to our Lady’s Shrine in prayer during our Annunciation Octave of Masses, and give your “yes” to God, just as Mary did.